The Mark Hotel in NYC was the first business collaboration for long time romantic partners Jacques Grange and Pierre Passebon. In 2006, they were hired by Louise Sunshine, a New York real estate marketing strategist, to redesign the 1927 Manhattan landmark into a modern hotel-apartment hybrid ~ 42 co-op apartments, 118 hotel rooms, lobby, bar and restaurant. Grange described the style of the guest rooms as “Jean Michael Frank, interpreted by me” ~ simple pared-down furniture combined with sophisticated materials and finishes. From the gorgeous leather desks to the sumptuous linens, it reads Paris chic with a twist of American modern. Instead of “An American in Paris” it’s “A Parisian in America” (sorry I couldn’t resist the Gershwin reference!) 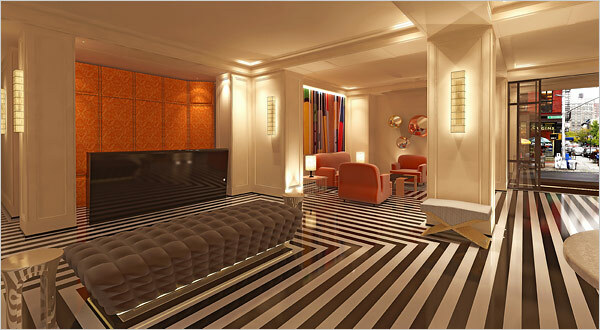 In addition to designing the co-ops and guest rooms, the duo commissioned artists Ron Arad, Mattia Bonetti, Vladimir Kagan, Guy de Rougemont, and Eric Schmitt to create one-off pieces for the Mark’s lobby, bar and restaurant. The next time I’m in NYC, I will most definitely be visiting the Mark Hotel! Oh and maybe I’ll just have to order Jacques Grange’s favorite drink, a caipirinha, while sitting at the hotel’s Guy de Rougemont-designed cloud bar! Sometimes life hands you a wonderful coincidence. You don’t question it or try to understand it but just accept it as a special gift. 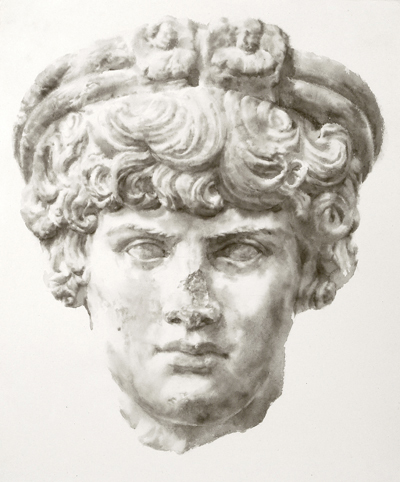 I was fortunate enough to experience a wonderful coincidence in an email exchange with Wendy Artin. Over the weekend, I posted about meeting her at the Gurari Collections group show and she mentioned how pleased she was to be on the same page as Jacques and Pierre. Without knowing their connection, I had posted about Jacques Grange and Pierre Passebon earlier in the week! The wonderful coincidence is that Wendy is one of the highly acclaimed artists at Pierre Passebon’s Galerie du Passage in Paris! 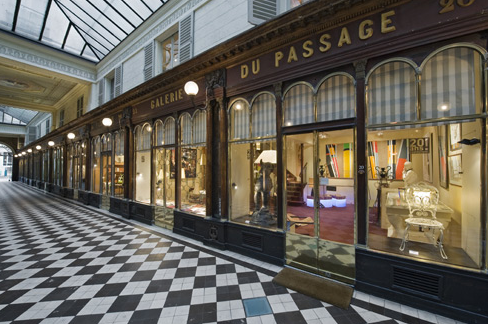 In her email to me this morning, she writes about Pierre ~ “his gallery is called Galerie du Passage…it is the most beautiful gallery in the most beautiful covered passage in Paris, the passage Vero-Dodat. It is truly an exquisite place, and I am always thrilled to show there! I have been showing with him since 1996. What an amazing coincidence that we ended up on the same page!” ~ A truly special gift! I’m also including some information about Galerie du Passage along with some photos from past exhibitions. Fascinating! 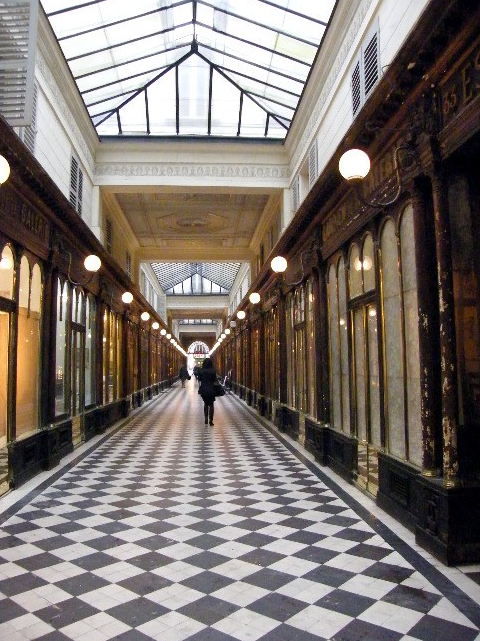 In 1991, Pierre Passebon opened the Galerie du Passage in the one of the most attractive covered arcades in Paris, the Galerie Vero-Dodat, where the neoclassical decor dates back to 1826. At the Galerie du Passage, furniture and objects of the 20th Century are displayed on two floors, arranged in unusual combinations. Pierre Passebon animates his gallery with temporary exhibitions of art and design, where artists of the 20th and 21st century renew their ties with the great tradition of craftwork. Christian Louboutin and David Lynch have locked heads and created a show, Fetish, which opened in Paris at Pierre Passebon’s Galerie du Passage. The exhibition shows five limited edition pairs of shoes by Louboutin alongside five signed photographs of the shoes by Lynch. A group of school kids surprised Pierre Passebon by showing up at the Galerie du Passage wearing masks made with the Kathy image from the YUL book. They loved the show and loved seeing the actual image on the wall. This is most definitely on my list of design books for the holidays!